Just in time for you to enter the new year in truly fashionable geek style, The Novo Geek has released the first of hopefully many more beautifully designed geek-themed jewelry, starting with a pair of earrings and a necklace set inspired by Battlestar Galactica. Dubbed the “Kara Collection”, The Novo Geek’s first foray into geek jewelry certainly does not disappoint, and pays wonderful homage to one of the show’s most important and popular characters. 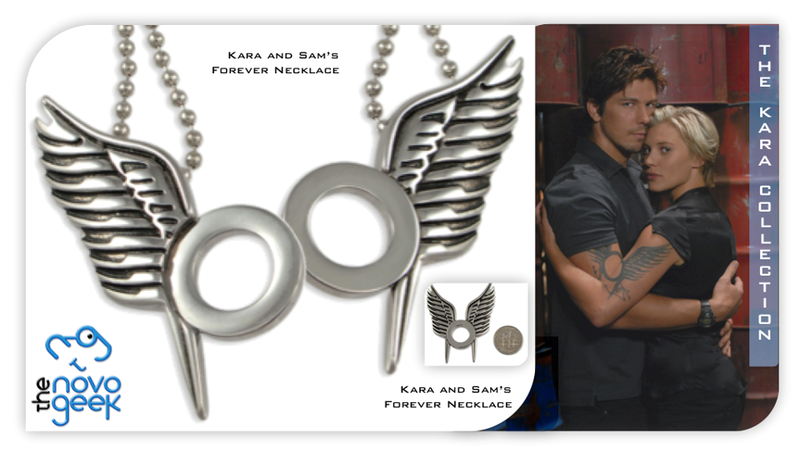 The Kara and Sam’s Forever Necklace reinterprets the show’s iconic tattoo in the form of a necklace. The special, unique feature of this necklace is that it’s actually two necklaces in one, so you can wear the set yourself, or give one half of the necklace to your loved one or a close friend! These first two jewelry pieces from The Novo Geek are a perfect example of subtle geek fashion, and with Star Trek and Dexter as part of their licenses, who knows what other jewelry is in store for 2013! For now, the Starbuck earrings and necklace are sure to pair well with virtually any outfit, and you’ll undoubtedly be complimented and admired by BSG and non-BSG fans alike.